Slaughterhouse characters with Shawn Crahan and Ian Miller (L-R). A heavy metal band from Iowa, known worldwide for its aggressive music and attention-grabbing image, is partnering with a haunted house in Des Moines. 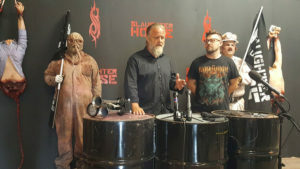 Slipknot co-founder Shawn Crahan spoke about the band’s plans to join forces with The Slaughterhouse at a news conference today inside the attraction. “It’s been a long time since we’ve done anything in Des Moines besides play shows, so we’re really happy to do this,” Crahan said. Slipknot got its start in Des Moines in 1995. Since then, the band has sold millions of albums, played on the biggest stages around the world and won a Grammy in 2006. Slipknot’s image centers around masks the nine band members wear. That imagery will be incorporated into the Slaughterhouse. “It’s going to be a lot of fun. It’s going to be scary. And it’s going to be heavy metal,” Crahan said. “Art at its most extreme.” Ian Miller is the owner of The Slaughterhouse, an attraction he first opened in 2010. “This thing that is happening is beyond our wildest nightmare come true,” Miller said of the partnership with Slipknot. Around 8,000 people passed through the haunted house in 2017. He expects attendance could grow to 12,000 this year. “But, with Slipknot, it could be much, much, much bigger than anticipated,” Miller said. Crahan said Slipknot fans, affectionately referred to as “maggots,” will likely be coming to Des Moines from around the globe. The Slaughterhouse is located in a 10,000 square-foot space that formerly housed a paint factory on Des Moines’ north side at 97 Indiana Avenue. The haunted attraction will be open October 5-28. The weekend of October 18-21 will include VIP packages, such as guided tours of The Slaughterhouse with members of Slipknot. Audio: Slipknot news conference 24:30.